Back in 2014, the Spider-Men of alternate worlds came together to face the Inheritors in Spider-Verse. Peter Parker led his counterparts to a narrow victory over the seemingly unstoppable beings who hunted them across the multiverse. Now, a Spider-Geddon has arrived and the Inheritors are breaking free of their prison. And it’s all Doctor Octopus’ fault! In the first issue of Spider-Geddon, the recently re-branded “Superior Octopus” used the Inheritors’ cloning technology to give himself an edge. However, the Inheritors used Doc Ock’s arrogance against him, and secretly usurped his control over their tech. Not even an assortment of Spider-Men and women were able to prevent the pending disaster. 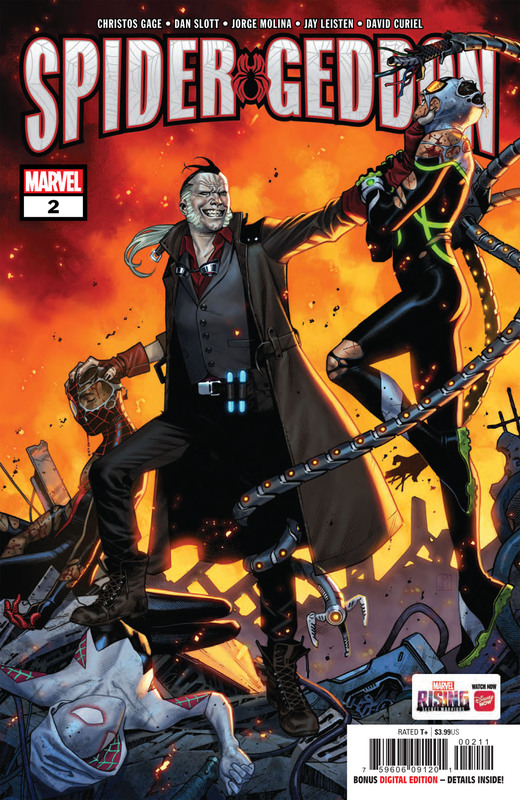 Morlun and his siblings emerged from the cloning tanks and immediately killed Spider-Man Noir and Spider-UK. Now, it falls to Miles Morales, Spider-Woman, Spider-Punk, Octavia Otto, Spider-Gwen, Spider-Ham, and Doctor Octopus to save themselves. However, the Inheritors have everything they need to make this world their own. And they’re hungry for more spiders. 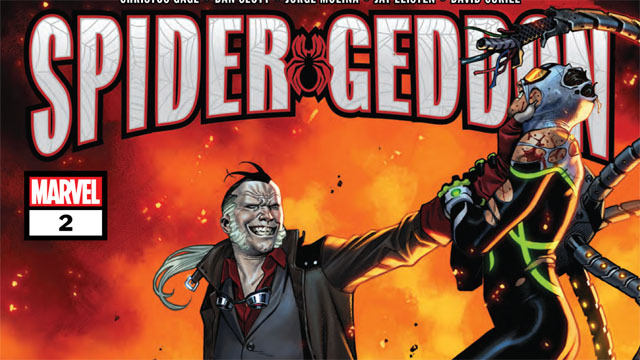 Christos Gage is the writer of the Spider-Geddon event miniseries, which is based on a story by Dan Slott. Jorge Molina is the artist for the series, and SuperHero Hype has the exclusive preview for Spider-Geddon #2. In these pages, the assembled web warriors face Vernam and Jennix while Spider-Gwen presents Doc Ock with an extreme solution to their current problem. You can read the full exclusive preview in our gallery below. Spider-Geddon #2 will be released on Wednesday, October 24.